If you are looking to make your skin smooth, soft and toned Juvéderm® Hydrate™ helps attract and hold moisture within the skin to restore a healthy natural glow. Your physician can treat your hands, neck, face and décolletage with Juvéderm® Hydrate™, which also features an antioxidising agent, helping to prevent the build-up of free radicals in the skin, so the effects of your treatment can be prolonged. The condition and tone of your face, neck and hands can reveal so much about you. Contact Cloud Nine Clinic today for a free consultation. HOW DOES JUVEDERM HYDRATE WORK? Adequate hydration is fundamental to maintain healthy skin tone, elasticity and smooth, youthful appearance. Your skin contains an important hydrating agent called hyaluronic acid which prevents your skin from drying out. As the years pass by natural levels of hyaluronic acid diminish, resulting in skin that can look dull and wrinkled and that feels tight and rough to touch. This process affects the areas which are often most noticeable, including your face, neck, decolletage and hands. Superficial treatment with creams can temporarily moisturise the skin surface but it cannot deliver and maintain the deep hydration which it needs to retain its natural elasticity and healthy glow. Juvederm HYDRATE is a clinically proven treatment that effectively replenishes depleted levels of hyaluronic acid in your skin to restore a natural, healthy glow. Juvederm HYDRATE has been specially formulated to be injected just under the surface of the skin to improve hydration, tone and elasticity. Juvéderm® Hydrate® is not a filler or volumiser, but a treatment specifically designed to improve skin hydration and elasticity in the face, neck, décolletage and hands. Please slide the handle on the image below to highlight the changes by choosing Juvederm Hydrate. delivers and maintain the deep hydration which it needs to retain its natural elasticity and healthy glow. Juvéderm ® HYDRATE is a treatment specifically designed to improve skin hydration and elasticity, resulting in a more refreshed appearance and a natural, healthy glow in the face, neck, décolletage, and hands. Juvéderm ® HYDRATE effectively replenishes depleted levels of hyaluronic acid (HA) in your skin to restore a natural, healthy glow. Hyaluronic acid is a naturally occurring substance found in the body that helps to hydrate and add volume to our skin. Natural HA is broken down by the body in one or two days so it is constantly replaced. As we age, this replacement mechanism diminishes, so the moisturising and plumping effects of HA decrease. Juvéderm ® HYDRATE also features mannitol, an antioxidising agent that helps prevent the build-up of free radicals within the skin that degrade HA. With the addition of mannitol, the effects of the treatment can be prolonged. How does Juvéderm® HYDRATE work? Juvéderm ® HYDRATE works because of the super-hydrating power of HA, which occurs naturally in the body. The hydrating effects of HA come from the fact that it retains water and absorbs more than 1000 times its weight! Juvéderm ® HYDRATE is designed to replenish HA lost through ageing, rehydrating the skin, and improving its elasticity and tone. It is administered through tiny injections about 1-2 cm apart. Once injected, the HA gel flows smoothly and distributes evenly into the skin. What will be involved in my treatment? The actual treatment takes from 15 to 30 minutes. First, our medical professional will clean the area to be treated and may apply an anaesthetic cream to ensure the most comfortable treatment possible. Then she will inject tiny quantities of Juvéderm ® HYDRATE product, using a fine needle below the treatment area. After the injection, our medical professional will smooth the product in your skin by massaging the treated area. How long will the effects of treatment with Juvéderm® HYDRATE last? 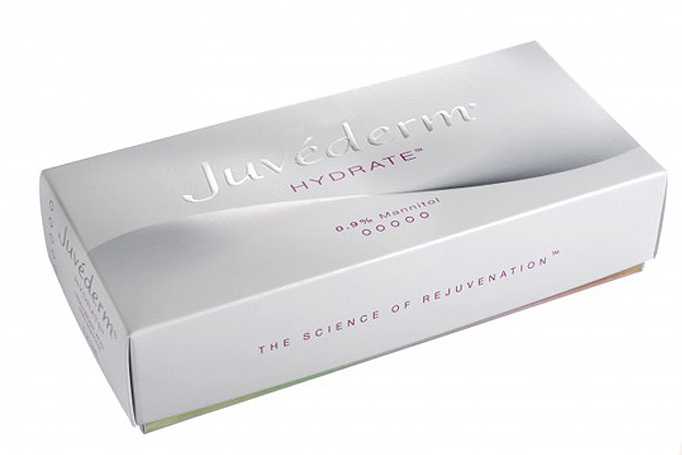 Results with Juvéderm® HYDRATE typically are long-lasting, up to 3 months when part of a skin regime. With Juvéderm® HYDRATE, your results are immediate and very natural looking. With a few small precautions, you can return to work and resume your social life immediately. Following treatment, you may experience redness, slight swelling, or bruising at the treated area. These side effects will not last and can easily be covered up with your usual makeup. You should not use use any makeup during the 12 hours that follow the injection treatment and avoid any extended exposure to the sun, UV light, and temperatures below 0°C, as well as any sauna or steam bath sessions during the two weeks that follow the treatment. “Decided to have lip fillers done as have always felt my natural lips were a wee bit thin. I went to Cloud NIne Clinic on a recommendation from a friend that had her lips done. The doctor spent about 10 minutes answering my questions about the treatment- mainly how sore is it?! Our experienced medical professionals offer professional anti-wrinkle injections, Juvederm Ultra dermal fillers and more at our modern clinic near to Glasgow City Centre beside Charing Cross in Glasgow West End. All anti wrinkle injections, lip fillers and dermal fillers are administered using only genuine products at competitive prices. Ask about our loyalty scheme on anti wrinkle injections, dermal fillers that lead to big savings on all treatments.